As a dog owner, you want to know that you are taking proper care of your dog. This means learning about basic dog care and meeting your dog's essential needs to ensure its health and happiness. Proper nutrition and health monitoring, grooming, a place to call its own, and plenty of exercise and affection will create an environment in which your dog can thrive. Luckily, all of these things are easy to provide for your pooch. Properly caring for a dog begins with having the right perspective. Dog ownership should not be seen as a chore, but as an experience that enriches your life as well as that of your dog. Like humans, dogs need food, water, and shelter to survive. Yet, they also need physical care and nurturing in order to thrive. Providing these things is an essential part of keeping your dog healthy and safe and sets the foundation for a long, happy life with your dog. A healthy, balanced diet is a fundamental part of basic dog care. Do some research into food companies that pledge to use high-quality ingredients instead of fillers. Then, choose a quality diet that your pet enjoys. Spending lots of money on a holistic, top-of-the-line diet is useless if your dog won't eat it! Many companies provide samples you can try without buying a whole bag. Others offer a money-back guarantee if your dog doesn't like the food. If you choose to provide a homemade diet, discuss the ingredients with your veterinarian first to be sure they are right for your dog. Then, make small batches until you're sure your dog actually likes it. Once you find an appetizing diet, watch how your dog responds over the first several weeks. A drop in energy level or a dull hair coat may warrant a diet change. If you do change your pet's food, always do so gradually—mixing some of the old food with the new—to avoid gastrointestinal upset or food aversion. It's also a good idea to ask your veterinarian for nutritional advice, especially if you notice any changes in your pet's health. Water is also essential to keeping your dog healthy. Make sure that your dog always has access to plenty of fresh, clean water to drink. Dogs are social animals and they are generally not content when excluded from the family unit. Though some circumstances may require dogs to live outside, most will thrive in a primarily indoor environment. Your dog should have an area of the house dedicated as its own space, such as a kennel, crate, or bed. This teaches your dog to have respect for its space and, in turn, yours. Set down ground rules, enforce off-limit areas of the house, and welcome your dog into permissible areas. If your dog spends time outdoors, provide access to a doggie door or a temperature-controlled doghouse. Never leave your dog unattended outside without shelter, especially during extreme heat or cold weather, as this can result in severe health consequences. Keep your dog healthy with regular exercise and preventive veterinary care. Establish an exercise routine, even if it's just a stroll around the block once a day. Depending on the breed, your dog may require more exercise to burn off extra energy and keep it fit. Establish a good relationship with a veterinarian and schedule a wellness check-up for your dog at least once or twice a year. Quite often, potential problems can be identified and treated before your dog actually shows signs of illness. Within just a few visits, your vet will get to know you and your dog and be able to make recommendations for any health or behavior questions you have. Every dog needs basic grooming, such as bathing and nail trimming. Some dogs even need regular haircuts. Find a reputable groomer or learn to groom your dog at home. Then, establish a grooming regimen and stick with it. Dogs thrive on structure and discipline. Proper training is paramount to your dog's quality of life. Choose a training program that works for your lifestyle and your dog's needs, then follow through with it. You may prefer to join a training class with a professional instructor or want to learn about dog training on your own. Either way, establish yourself as the boss, reinforce good behavior, and humanely correct misbehavior. Be consistent and you will see positive results. Maintaining the human-canine bond is vital for your dog to thrive and it's a major component of basic dog care that many people disregard. Remember that domestic dogs are social animals that need interaction with humans. 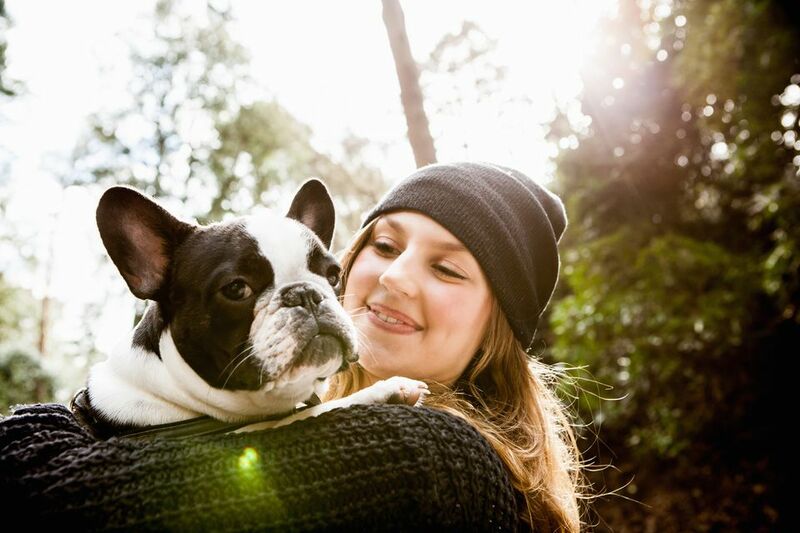 Set aside time for you and your dog to bond each day. Petting your dog, playing with toys, talking to it, or taking the dog for rides in the car are some ways you can strengthen and preserve this bond. Any of the elements of basic dog care can be customized to your needs and what your dog accepts. Many dog owners, for instance, find that crate training is essential and that is where their dog spends much of its lone time. Then again, some people prefer more of an open living arrangement and train their dog to obey house rules without a crate. The key to remember is that if something is not working out, there's an alternative that you can try that might work perfectly. It's also important to be patient with your dog and try not to make too many drastic changes all at once. Many dogs thrive on routine and upsetting that can lead to behavior problems. Whenever you're in doubt about your dog's basic needs, ask your vet for advice. Beyond health concerns, vets want to make sure the animals they care for are living as happily as possible, so most are more than willing to help with any questions you have.